On his way back home from London to the Shires, DonQui decides to pick up something simple but tasty for supper. As it so happens he has to pass by the nice Mr Waitrose’s shop on the way, so he drops in to see what is on offer. As is always the case when he stops off at Waitrose, DonQui ends up buying far more than he had intended. His shopping basket is filled with buttermilk (for pancakes) and Canadian maple syrup (amber mind you not just the ordinary medium) to go with it. Some coconut cream for stir fries; liquid unsalted stock for sauces; and thin streaky bacon (difficult to find in the UK) for breakfast. As it happens there is also a Rioja, a Chablis and a Calvados on offer at reduced prices and so these too manage to find their way into DonQui’s shopping basket. At the fish counter there is one remaining large trout filet. This will do for supper, DonQui thinks, adding a medley of ‘sea vegetables’ (samphire, sea aster and okahijiki – or Japanese land seaweed) to his purchase. DonQui cooks the trout ‘en papillote’ baked in the oven for 15 minutes with herb butter, lemon and parsley. Waitrose seals the fish in a parchment parcel for him in store. Previously DonQui has cooked fish like this by simply placing it in an ovenproof dish and covering with tin foil. 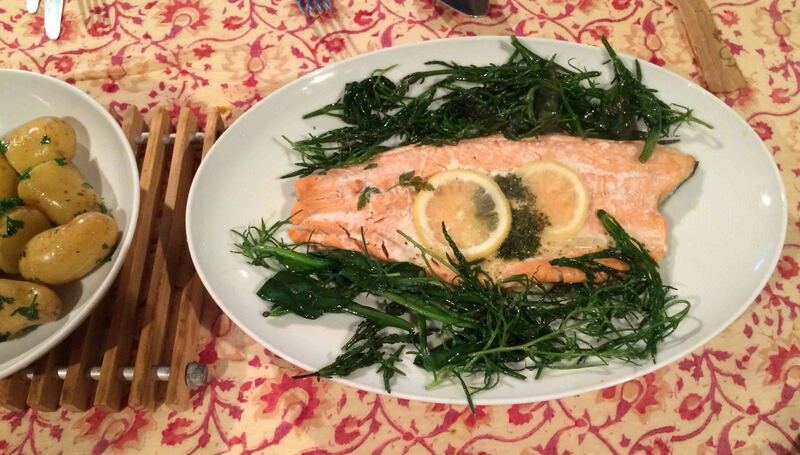 He serves the trout filet with boiled charlotte potatoes tossed in parsley and butter alongside the sea vegetables. The latter are incredibly easy to prepare as all they need is a 2-3 minute stir in butter.